Childhood sweethearts Carmen and Alfredo live a life of quiet bliss in Satélite, a sleepy suburb outside of Mexico City. When Alfredo is offered a promotion, the lovebirds make the move into the bustling metropolis. It’s a rude awakening for Carmen, who until now has not really worried about the fact that she and Alfredo are both overweight. After overhearing gossip about their bodies at a company party, she decides that it is time to swap donuts for salads, and urges Alfredo to join her in a weight-loss program. But when only one of them actually starts to slim down, a rift emerges in their relationship. Portrayed with undeniable charm by newcomer Daniela Rincon and well-known Andres Alameida, Paradise touches upon issues of body image, self-confidence and happiness with candor and humor. The film is executive-produced by Diego Luna and Gael García Bernal. 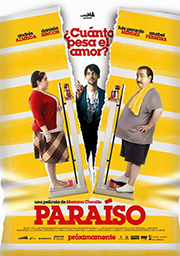 Based on a short story written by Julieta Arévalo, Paraíso is a film about change. It is about the fear we feel when our life changes causing things to slip out of our control. Throughout her journey, Carmen will have to understand that sometimes it is not only us who change, but also our surroundings and those close to us. And although this might generate in her a lot of fear, it also gives her the courage to ask herself, for the first time, what she really wants out of life. For me, the two pillars that sustain the story are love and life’s own irony. Love as the only real and tangible thing that exists. And life’s irony as the moment when we realize that situations in our own lives that, while not immediately funny because they embarrass us and they expose us, when they are revisited and retold start to have another meaning and function. It is something that allows us to take a step back and look at ourselves from the outside and understand the journey we are on and why we are going down that path.